Being involved in ministry ultimately means that your entire family will be affected by your involvement. Keeping perspective of mission can be a fragile business in such instances. Here are some pointers aimed at maintaining that perspective and balance with regards to your family and ministry involvement. When you allow the pain to outweigh the privilege ministry becomes unbearable. It is possible that in your attempt to protect your family/marriage from the negative side of ministry that you wind up alienating them from the church. When you use language like “family time”, “them and us”, ” protect against” etc you foster the idea that the family is distinct from the church and in need of protection from the church. By implication, the church is a potential threat. The truth is that the family is part of the church. The opposite is also true, if there is no thought given to intentionality then the family can be swallowed up in busyness. Front footed Christian leaders reflect their priorities in their diaries. Ie, the family, rest and personal devotion find their way into prime positions and the calls and demands of ministry are joyfully slotted into the remaining spaces. This way family is edified and included in ministry. Practically, I suggest husbands and wives should plan at least 10 days in advance every 7 days. Making prayerful decisions regarding the issues/people and family members who require primary investment. Zero planning will result in the urgent replacing the important. Some personalities work best with routine and others are more spontaneous. Regardless as to how structured/spontaneous you are, every family does better when there is at least some form of rhythm to their lives. Family traditions, customs form the glue that memories cling to. Each couple would do well to see what habits, activities or emphases their family thrives best under. 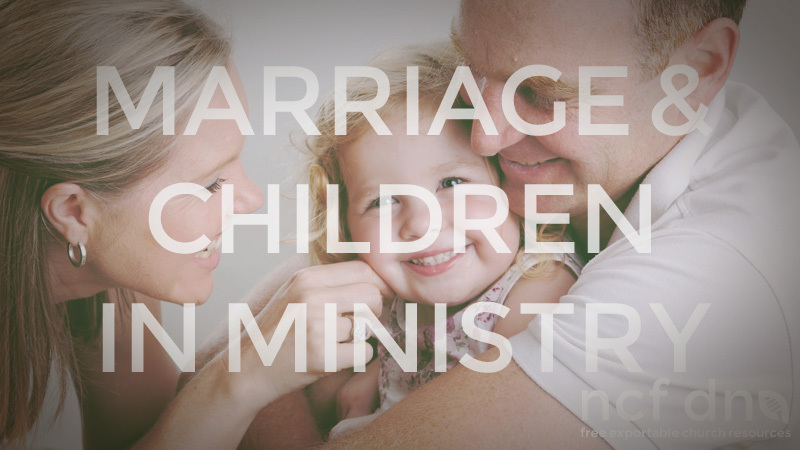 Meal times, birthdays, date nights, games evenings, outings or bedtime rituals can all help families rejuvenate in ministry. A day off every week is Biblical. Holidays need not be expensive, but they need to be planned. What makes you rest might not be what makes your spouse rest; work it out, talk about it, and plan accordingly. Some do well at home with the phones off, others have to get away. When my children were very little we had family devotions, but when they could read I stopped family devotions for a few years, arguing that they all needed their own devotions. I soon realized how foolish that was. A family should pray together and share a love for the Lord together. You might not get it right every day, but surely the family should gather before the Lord regularly. I constantly have to tweak when, how and where we have devotions together. Its a value worth fighting for. Some wives appreciate detail, others just require the headlines. Some wives handle conflict and discomfort well, others should be spared most the pain. Wise pastors will be able to discern what detail to drag home onto the bedroom pillow and what to leave outside the garden gate. While there should be no secrets in marriage, spouses need to learn how to share headlines without divulging detail which breaks confidences. We believe in ‘one flesh ministry’ that is, team ministry. Husbands and wives being on the team together. This does not mean that wives and husbands both engage in all ministry activity equally. In the areas of travel, counselling, public speaking etc each couple has to work out the grace on each individual and operate in that space. We need to free each other by speaking about what we do together and what we do apart. Ministry is loaded with pressure. Pressure from peoples’ expectations, meetings, ministry outputs conflicts, persecutions etc. Each person needs to learn how to deal with stress. Good sleep, good friends, good exercise and good communication all help as release valves. Couples themselves should also have a means to release pressure. It is possible that spouses act as a pressure release for each other, but without outside help it’s possible that your combined stress builds up. Ideally, couples should have activities and other couples that they can “blow steam” with; have fun with. We need to be able to discern when we are most vulnerable eg. Garry Chapman’s ‘love languages’ are very helpful in understanding how we encourage each other. Even the best parents sometimes see their children move away from God. Your children learn from your life more than your words. Loving your child does not mean you centre your world around them. Loving your child means you centre them around the Lord.